Japanese Prime Minister Junichiro Koizumi has arrived in Kazakhstan to begin the first visit to Central Asia by a Japanese premier. Mr Koizumi's four-day trip, which also takes in Uzbekistan, is expected to concentrate on energy deals with the oil and gas-rich countries. Japan relies heavily on foreign imports to meet its energy needs. 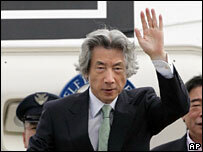 "It is not good for Japan to be too dependent on the Middle East," Mr Koizumi said before his departure. Mr Koizumi is due to step down in September, and has spent much of his last few months in office travelling to different countries to cement deals and promote Japan's case for a permanent seat on the UN Security Council. As well as securing oil and gas for energy-starved Japan, analysts say this trip is also being used to counter the growing influence of China and Russia, especially since the formation of the Shanghai Co-operation Organization, linking the two countries with Kazakhstan, Uzbekistan, Kyrgyzstan and Tajikistan. The Japanese premier is due to meet Kazakh President Nursultan Nazarbayev later in the day in the capital Astana. They are expected to release a joint statement on bilateral co-operation to develop uranium mines in the country. Kazakhstan has 30% of the world's uranium reserves. After his trip to Kazakhstan, Mr Koizumi will fly to Tashkent on Tuesday, and meet Uzbek President Islam Karimov. As well as discussions on energy, Mr Koizumi is also expected to raise international human rights concerns during his time in Uzbekistan. The international community reacted angrily last year when troops fired on crowds in the town of Andijan during an uprising. Uzbek officials say 187 people died, but witnesses put the figure much higher.